When you decide to paint the interior of your home, you spend hours sorting through paint colors to find the perfect hue for your walls. But, what about your ceiling? 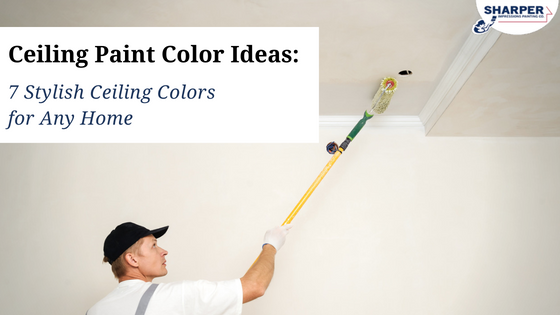 Many people simply paint their ceilings white because it is the easiest choice. While white paint on ceilings definitely has its benefits, you may simply be sticking with white because you’re unsure if painting your ceiling a different color is actually a good idea. The truth is, you can get away with painting ceilings in a variety of colors while not going over the top. Give the interior of your house some subtle style with these ceiling paint color ideas that are sure to look great in any home. If you haven’t heard of greige paint, your home is certainly missing out! Greige is a mixture of grey and beige making it the perfect neutral color for walls and ceilings alike. This neutral ceiling paint color complements practically everything allowing your room decor and furniture to stand out. Many experts recommend greige paints that have warmer undertones to ensure your ceiling remains neutral and understated, but not completely void of pigment. Ceiling Paint Color Tip: Stonehendge Greige by PPG Paints is a warm neutral greige that is ideal for ceilings and interior walls. If your room has plenty of natural light and you want to add an elegant touch to the space, painting your ceiling in a darker neutral color such as charcoal gray can be an excellent choice. While a dark gray may not be the most obvious color for a ceiling, it can still look stylish in the right setting. Charcoal gray can lower a higher ceiling and create an intimate feel in a room. This neutral ceiling color also helps highlight intricate details such as those found in crown molding. Ceiling Paint Color Tip: If you paint your ceiling dark gray, use a pale color on the walls to open up the room and create contrast. Another darker color that looks great on ceilings is navy blue. When you’re looking to add depth or drama to your room, navy can be an ideal hue for your ceiling. This is especially true if your room has white or gray walls. If you’re hesitating to go darker on your ceiling, you can create a more sophisticated and polished look by choosing a navy that is a few shades darker than your wall color. This will help give the room a more balanced look without the stark contrast that comes with white walls. Ceiling Paint Color Tip: Paint your ceiling and upper walls navy blue, then balance out the darker hue by painting beams or woodwork white. Ceiling paint can also make a dramatic statement without looking too bold or bright. Choosing a ceiling color in a warm gold or bronze hue can make a statement while creating a cozy, enveloping feel if used with the right wall colors. Try warm gold or bronze on your ceiling if you have creamy white or pale neutral walls. Ceiling Paint Color Tip: Warm gold and bronze ceiling paints work wonders for a room when you use dark accents and decor to tie everything together. Yellow on ceilings can be bright, cheery, and even neutral if you pick a shade that isn’t too bright. Painting your ceiling in a pale yellow will add beautiful energy to a room and transform an ordinary space into something truly joyful. Whether you have white walls or an area that is already full of color, pale yellow can be a great option for any room in your home. Ceiling Paint Color Tip: Painting your ceiling pale yellow can help draw your guests’ eyes to other decorative elements in the room. Try painting both your ceiling and walls the same pale-yellow color and keep your trim white for a bright yet subtle transformation. The color sage is popping up everywhere these days; on interior walls, house siding, and yes, even ceilings! There is good reason for it, too. Sage is a soft green hue that can add a punch of color to your home without going overboard. Sage ceilings are tranquil, relaxing, and look spectacular with a variety of neutral wall colors like creamy whites, beiges, and browns. Ceiling Paint Color Tip: If your room has architectural detailing, paint your walls in a deep sage and the ceiling and architectural details in a lighter sage to help the architectural details stand out even more. For decades, homeowners have been painting their ceilings white. While you may think this standard hue has been overdone, white ceilings are often the best choice for most rooms as the color complements almost every shade on the color wheel and can help boost resale value. Ceilings that are painted white offer many benefits including the ability to cover candle smoke, cooking oils, and sunlight stains. Try painting your ceiling white if your room is filled with bright colors, you need to add sophisticated charm to main living areas, or your ceiling is textured or has visible imperfections. Most ceilings call for flat or matte paint so they can mask these imperfections in drywall and also don’t reflect too much light. Painting your ceiling white can also open up a smaller space and help lower ceilings look like they have been elevated. For smaller rooms like a bathroom, taking white from the wall to the ceiling makes the space look even bigger. Ceiling Paint Color Tip: If you’re not into stark white ceilings, opt for white ceiling paint with warmer undertones to bring a softer look to your room. Ceilings are often overlooked when it comes to interior painting yet should always be treated as the “fifth wall” in any room of your home. Painting your ceiling in the right color can add character and style without sacrificing resale value. Don’t let a plain ceiling become a missed opportunity! Ensure that your ceiling painting project is completed correctly and with no messes below by contacting professional painters for help. Get your free ceiling painting quote today!